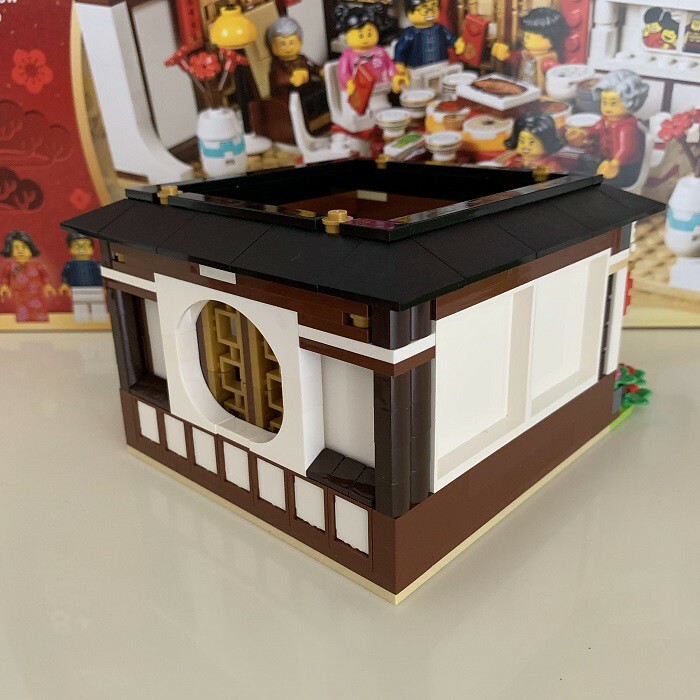 A new start of the year 2019 and I will begin with my very first review on this regional exclusive LEGO seasonal set. 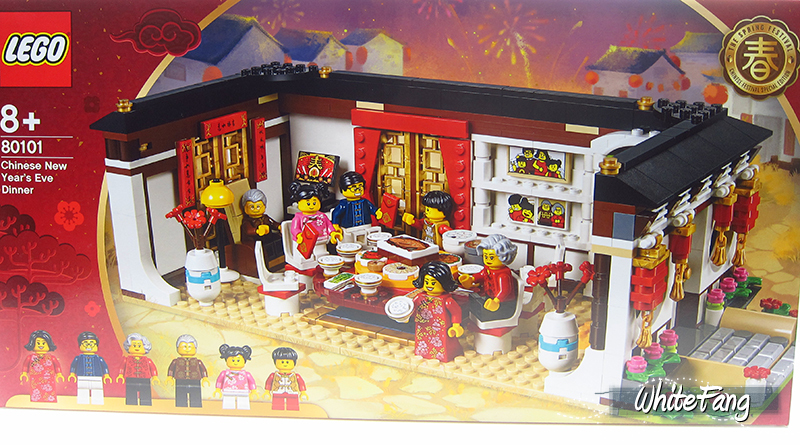 These new Chinese New Year sets are highly anticipated and are hard to come by if you are not situated in Asia Pacific region. This set is currently available in China, Hong Kong, Japan, Malaysia, Singapore, Taiwan, etc. It is also rumoured to be available for a short period of time. Not exactly sure if is factually correct. Our international AFOLs such as Europe and US are likely require to rely on secondary marketplace for sourcing. Without further ado, let me share my perspective if is indeed worthwhile for you to get this set and add into your collection. 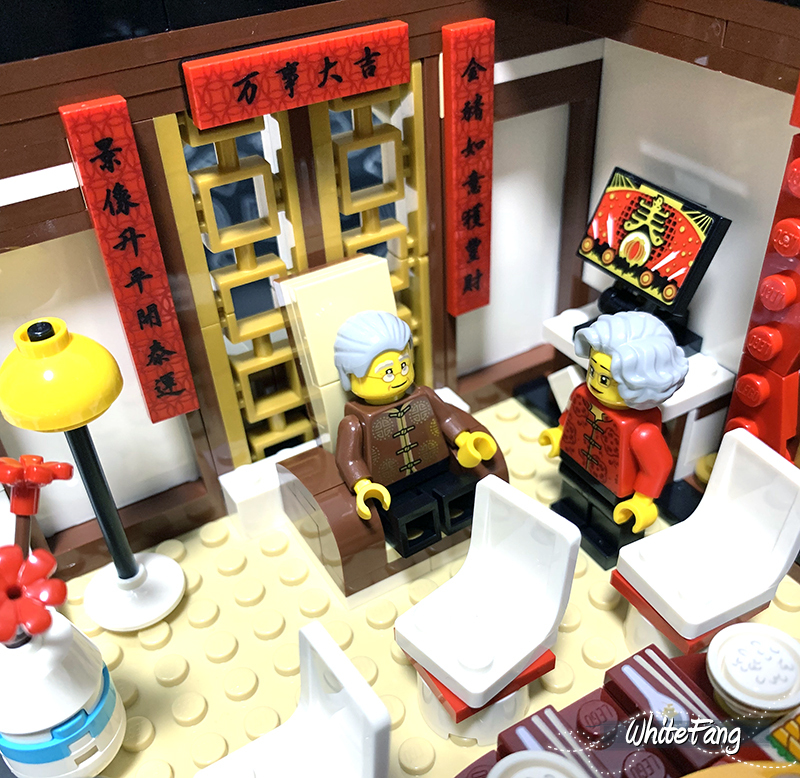 This is indeed a mega surprise for me to see an official LEGO set like this being released under the Chinese Festival Special Edition flag. When this set was first released couple of days ago, these were flying off the shelves until I managed to get it locally in TRU by paying SRP for it. Well, I personally find is worth the SRP and it is reasonably priced. The box is quite big and is highly recommend to debox in order to save some shipping costs if you are intending to import elsewhere. As a Chinese, the Chinese New Year is an important traditional festival and is widely celebrated in Chinese community. 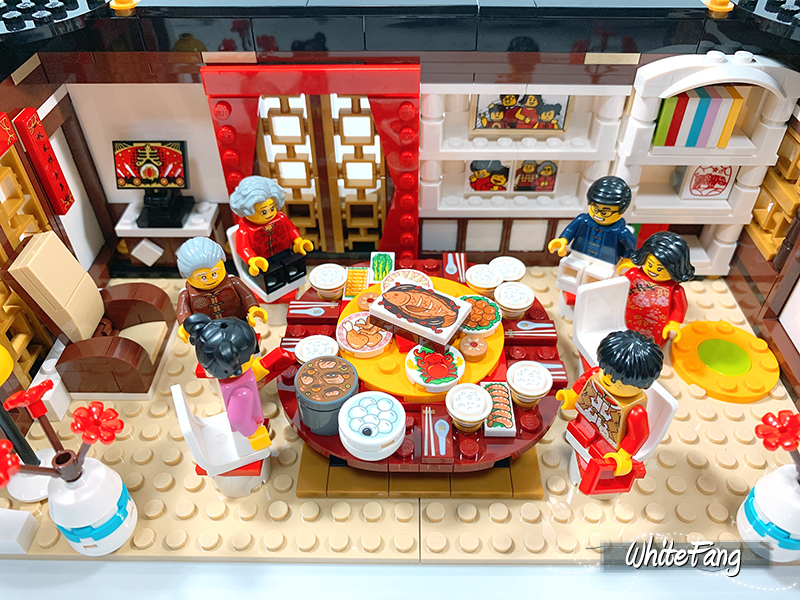 This is a very meaningful set which illustrate the importance of family togetherness in Chinese New Year Eve, where the loved ones will gather for a reunion dinner in the living or dining area before ushering the New Year. For the coming 2019 Lunar Calendar, it is the Year of the Pig which we are looking celebrating. 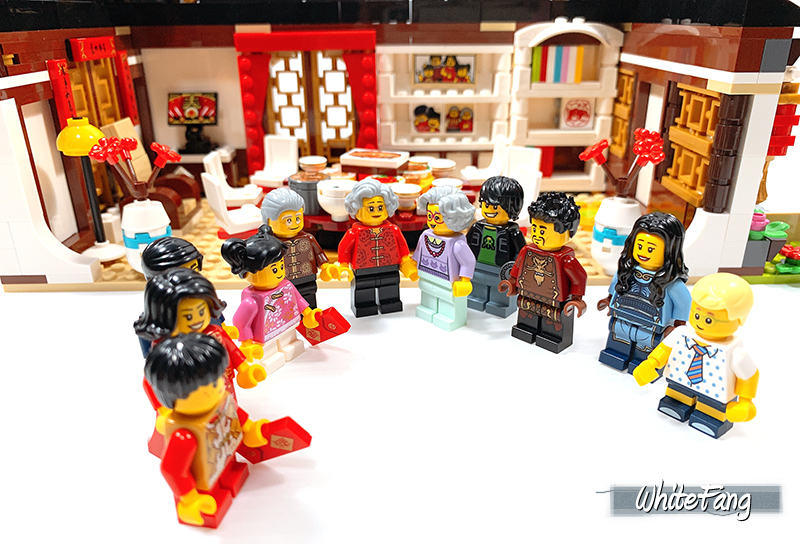 The Chinese placed huge emphasis on the reunion dinner and this is the set where I can relate my grandparents, my parents, siblings and my spouse together celebrating. 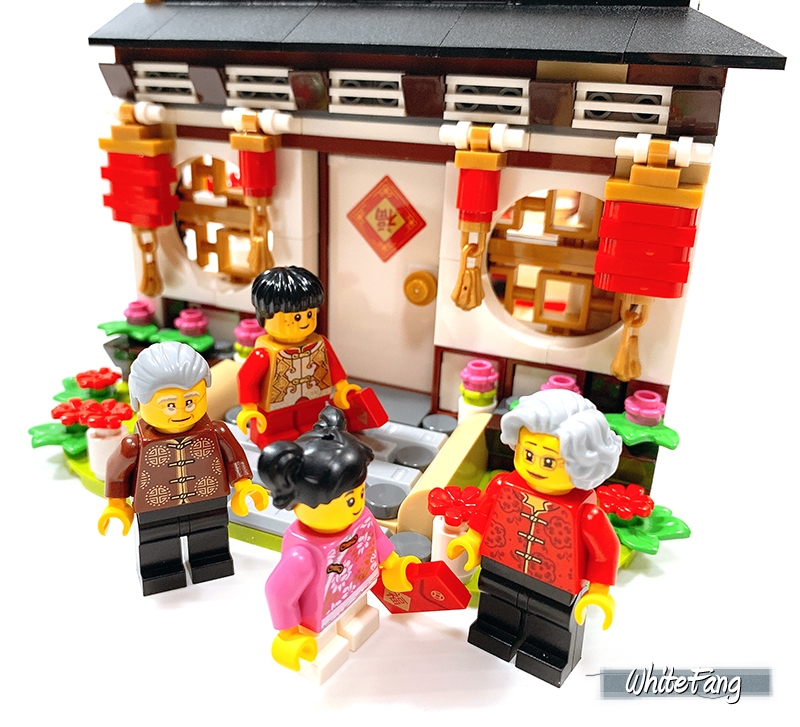 Even though families may grow apart when they grow up, it is the Chinese New Year which will always bring us back and be filial to our parents. Although this set was not explicit but I visualise the house belonging to the grandparents and the family coming over for a visit. That's how I will look at it. The sealed box come with five numbered mint packs. 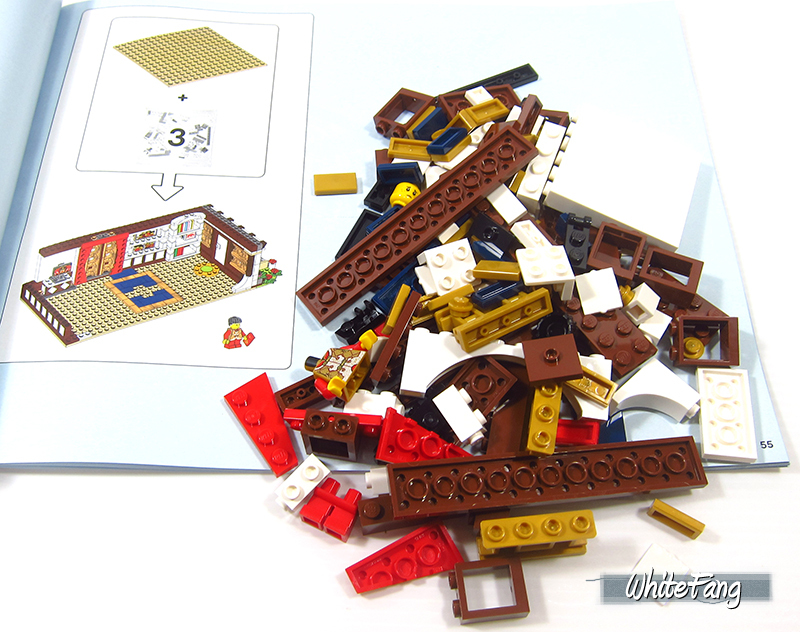 The box contain an instruction manual which also reveal the building stages overview and 2 units of 16x16 Tan baseplate. It also contain an essential sticker sheet. 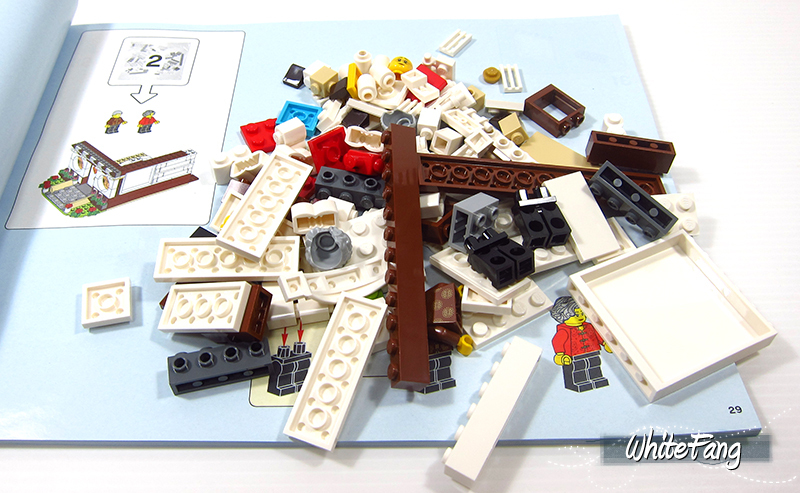 After completing the built, these are the remaining spare parts including an orange brick separator. 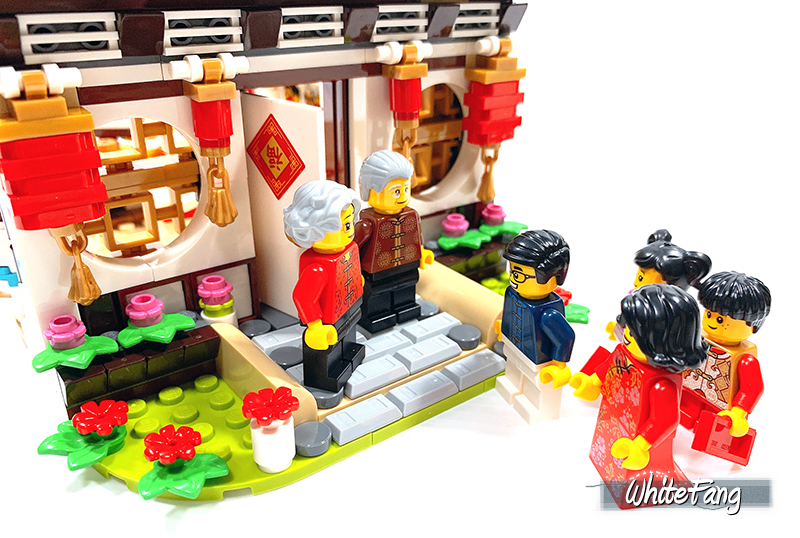 The next In this set, there are six nice minifigures illustrating the 3-generation family which comprise of the grandparents, parents and children. 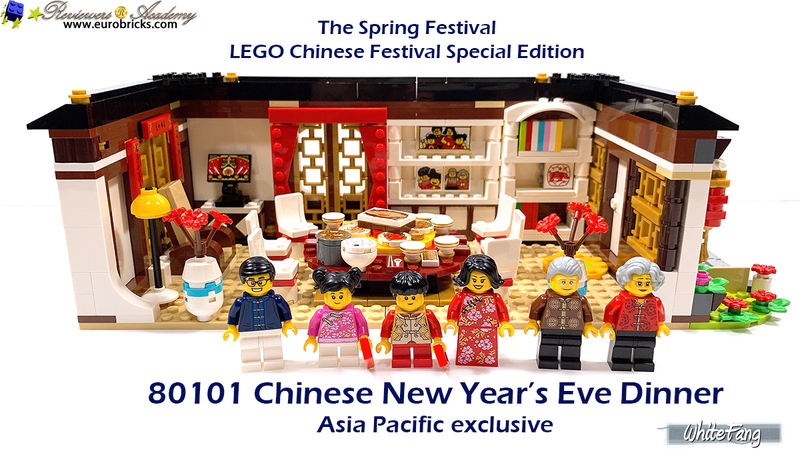 The minifigures are wearing new clothes for the Chinese New Year. Flowery and bright clothes are the way to go and it is a taboo to wear black colour as it will offend the elderly. I find the minifigures' design prints are pretty excellent with the traditional attire, not forgetting the fact that all of these minifigures contain back printing. The mummy minifigure is wearing the new skirt slope while the children are still equipped with their traditional short legs. I was hoping they were given movable short legs instead to increase playability. Each of the child is holding a printed 1x2 red packet tile. 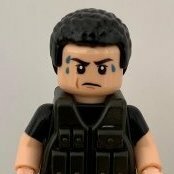 The minifigures are also included with alternate expressions and I am pleased to note four out of six minifigures contain another side of their emotional feelings. The completed built of the house is simply amazing and filled with tons of details and is quite comparable with the 21302 The Big Bang Theory setting. I had to applaud the designer effort and I am very keen to know who is the designer as well. He had certainly combine modern and traditional elements of a typical Chinese home in a very warm and cosy environment. 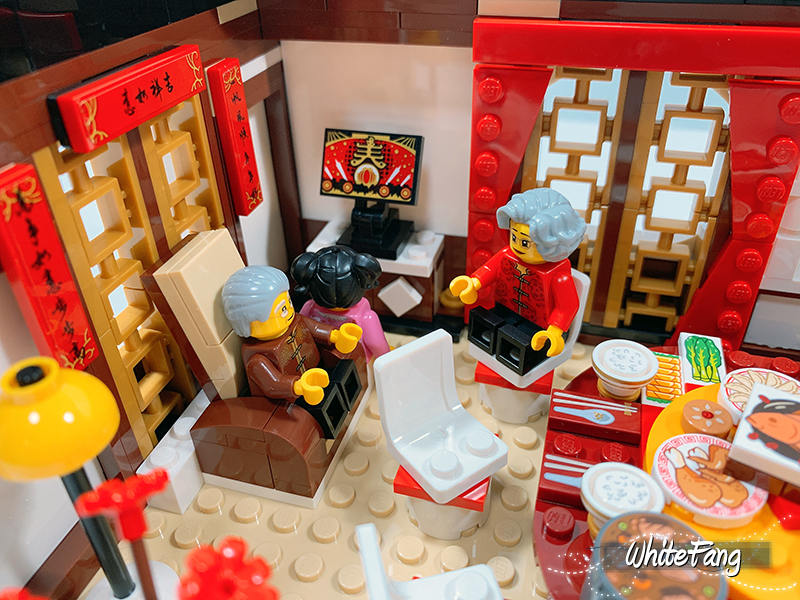 You can see some awesome interior details like the shelving, computer monitor which showing the Chinese New Year countdown programme, curtains with traditional pearl gold window grilles which are great parts, Chinese couplets, and family portraits. You can enjoy viewing more of the up close viewing angles from the front view, festive decoration at front entrance, side view (L) and side view (B). This is the most exciting highlights. All of these printed tiles and bowls can be found in packet 5. It contain 7 bowls with 1x1 round rice studs inside, 6 pairs of chopsticks/spoon in 1x2 printed tiles, a wide assorted of circular dishes like black sesame buns, meat stew, dumplings, chicken, crab, fried stuff, some sides in 1x2 printed tiles like prawns, spring rolls, chye sim, and a big fish in the centre coupled with a 1x1 round printed stud that depict something like a sauce (I think). 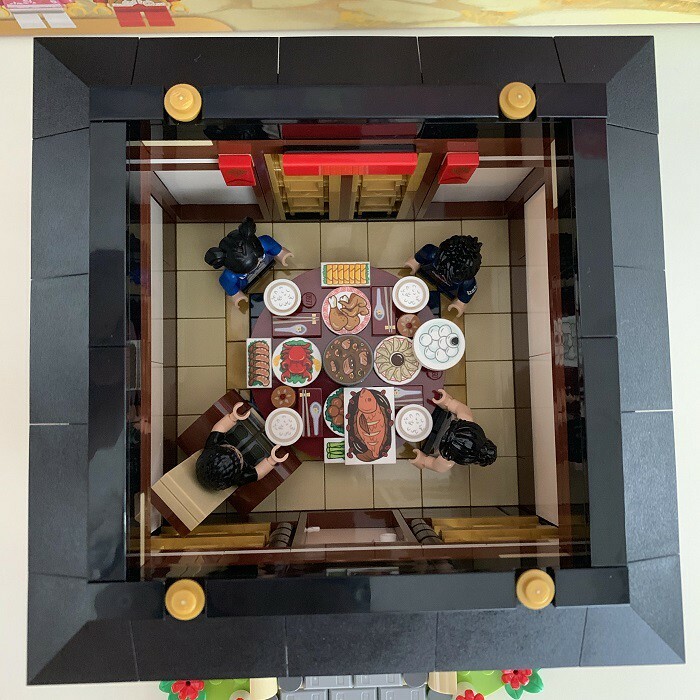 More importantly, the Lazy Susan at the dining table can be rotated with ease and is quite a common sight for big families since most of the Chinese serving are done in communal style. To conclude, this is the most impressive 2019 set which is released so far and I had so much enjoyment building this set up. I can just pick it up and show to anyone who are able to quickly identify the key meaning of this building set. Very impressive. 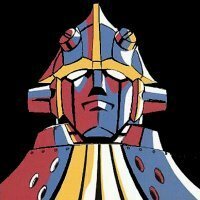 The only pity is due to its exclusivity in Asia Pacific region. Not to forget that there is a 80102 Dragon Dance which I had also bought and aim to build it soon and the last elusive 80103 Dragon Boat which is going to be exclusive in just China. We shall see how this develop and I hope you will get a chance to own this great building set as well. Sweeet! Nice work. Didn’t expect a review so soon. To be honest, I wasn’t confident to complete in such a short time. I am glad that I had pushed myself in time for this review. Hope to find time for the next project as well. Thanks for a great review, @WhiteFang. 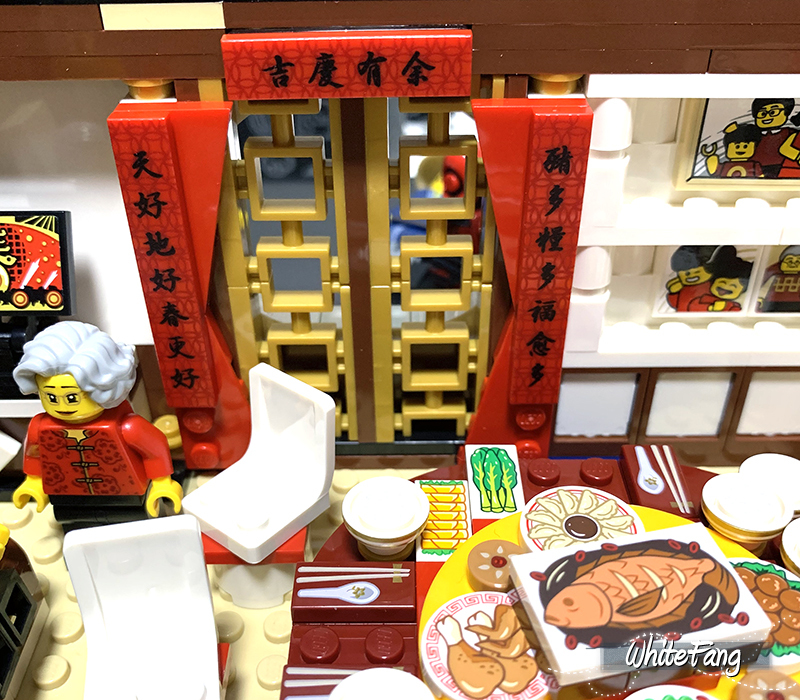 This is a beautiful set and what I loved the most about your review is the added details on the celebration of the Chinese New Year. It's great to hear it's a realistic set of area-specific celebrations. 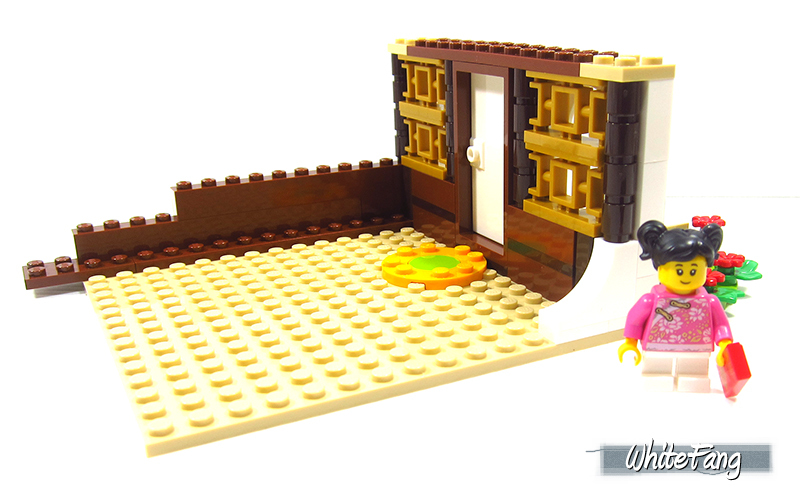 The set is on my wish list to buy some day (depending how widely it will be available on Bricklink). For me, this is the only minus of the set, being available in a limited region and not worldwide considering there are Chinese communities worldwide. 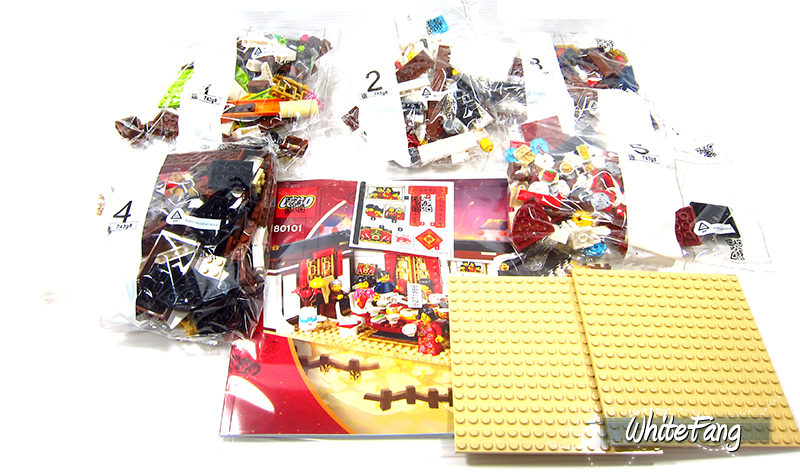 From my point of view, the set looks great as a parts pack, with lots of intricate printed parts, lovely minifigs (floral prints and ponytails), as well as many small parts to accentuate the atmosphere. Specifically, the lamps hanging by the front door, the pear gold fences used for windows, the white porcelane vase etc. Family photos are a nice addition, too. All-in-all, the designer(s) did a great job creating such a fascinate set. Now I'm really looking forward to your reviews of additional exclusive sets. I might have to spend the money on the second-hand market for this one! 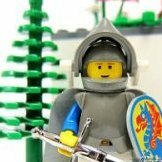 Bricklink, here I come. That's a great array of food and torsos and a few nice parts. I only hope they become available in normal sets too. This set reminds me of BBT set. It will be interesting to see modders putting a roof to the build to make it a more complete building. 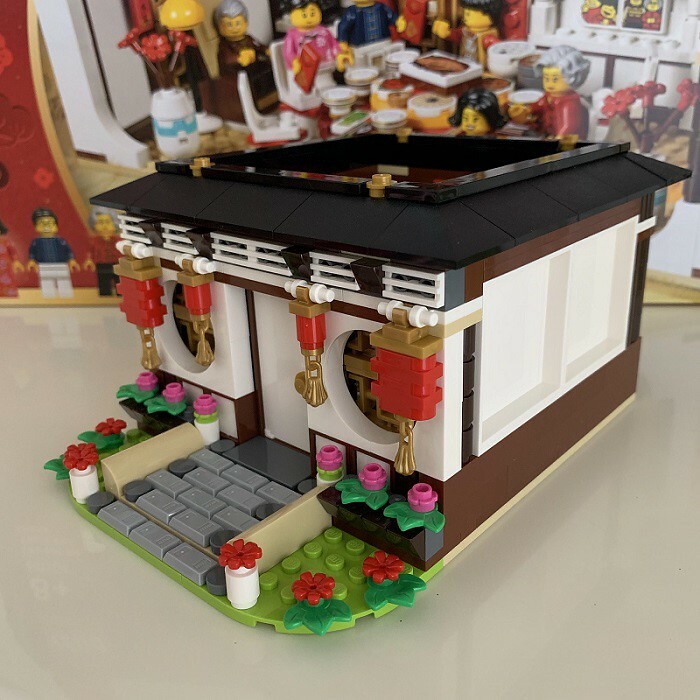 The design of this set is so accurately chinese, which is unbelievable that it came from LEGO, whos products have always been the more western styled designs. I really wanna know who is the designer and the graphics designer of this set! The designer for the Dragon Dance are at least Nick Vas (@princegalidor) and Niek van Slagmaat (@toothdominoes), so perhaps they were also involved with this one. 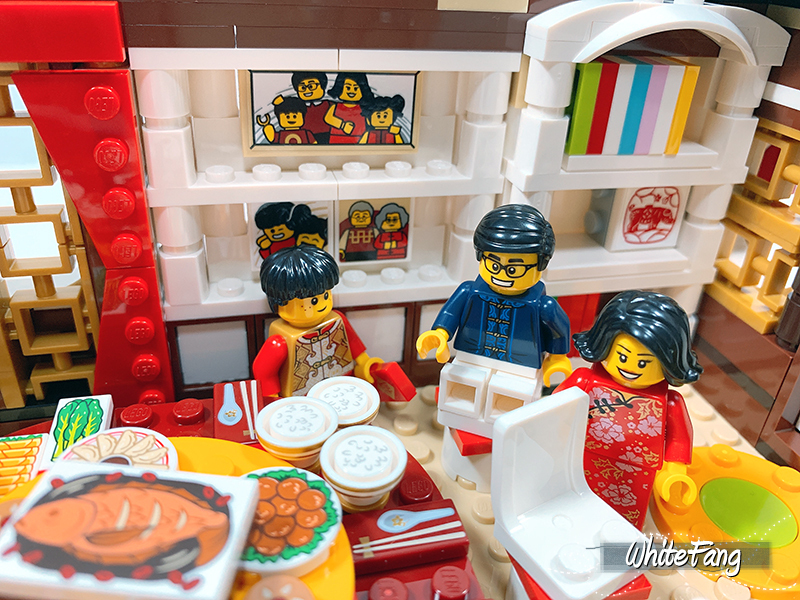 It's nice to see such a warm family scene, even though this one is just ment for Chinese customers. I hope it will prove popular among them. 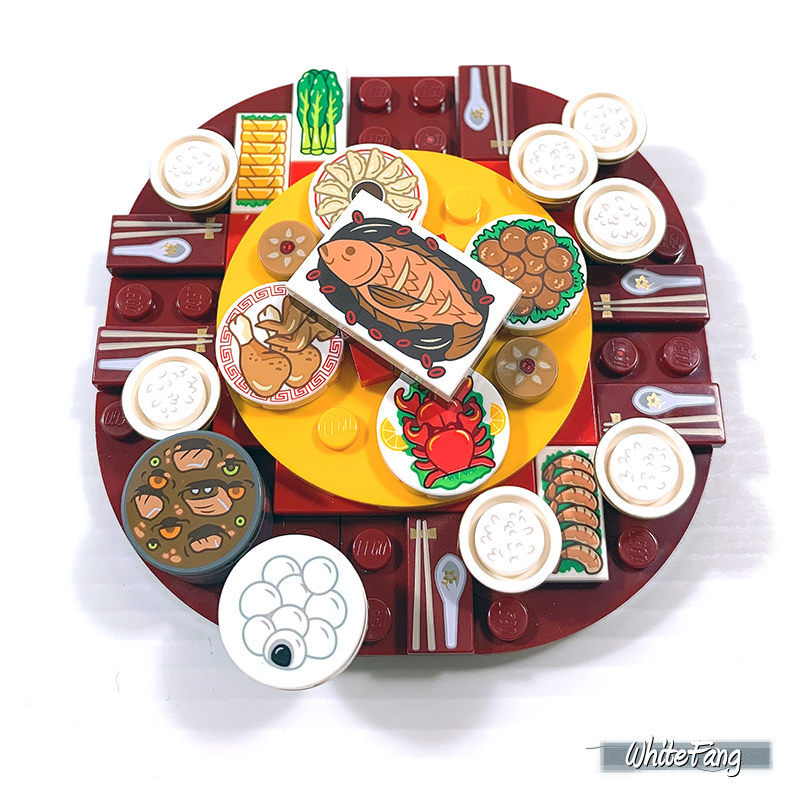 Personally I think the dining table would look better with fish and crabs animal and other food moulds, I think the printed food tiles feel a bit old-fashioned. The bowls with rice look nice though! Thanks guys for your comments and views. It really pleased me to see other AFOLs who are not Chinese are also equally excited about this built as well. You definitely ought to get this and I am pretty sure you will enjoy it. Don't let the exclusivity discourage you. Same sentiments. I hope the printed tiles will also be made available in other future sets. I also look forward to see what builders can do with this basic design to make the entire house complete. I also hope to find out who is the designer of this set as well. It is pretty accurate to me. Nice, I didn't know Nick was involved in the Dragon Dance design. Thanks for bringing this to my attention. If they had gone for the actual food molds, then the table will definitely be not enough to accommodate all of the food cuisine. I think printed tiles work fine for me at this point. Printed Food and Utensils on tiles is good enough for detail imo. Shame it's not available in Europe. Very nice review and lovely set. I am very sad about the exclusivity of this and other regional sets, though. I would buy this in a heartbeat at anything like normal lego prices - I am not sure I understand Lego's decision here. 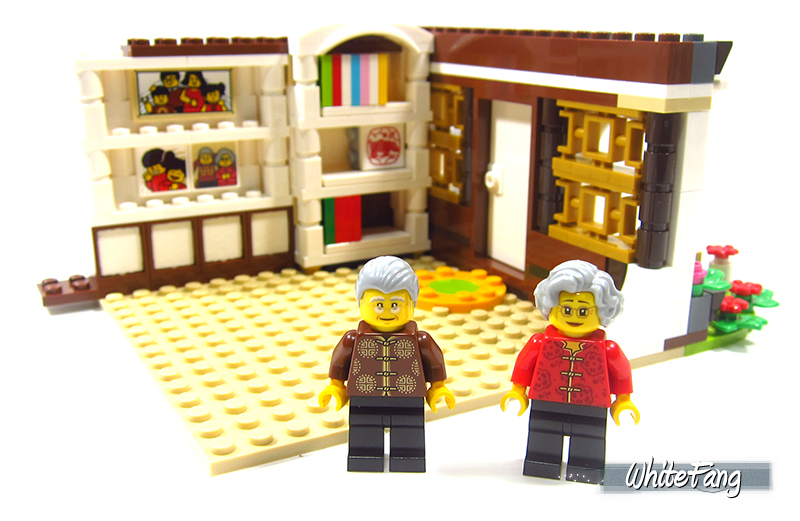 Maybe we should start a petition to make them available for the lego shop online? 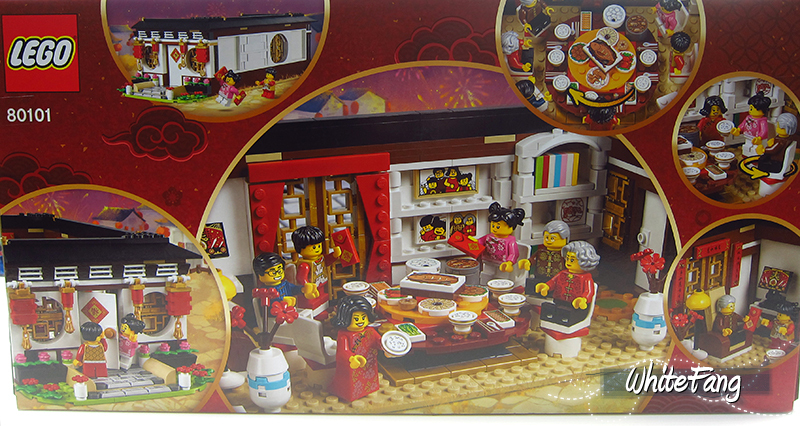 I just bought this set with the Dragon Dance set. My parents will bring them to me in US from China. Because Spring Festival is coming, the price is increasing. I also bought a lighting set for it. 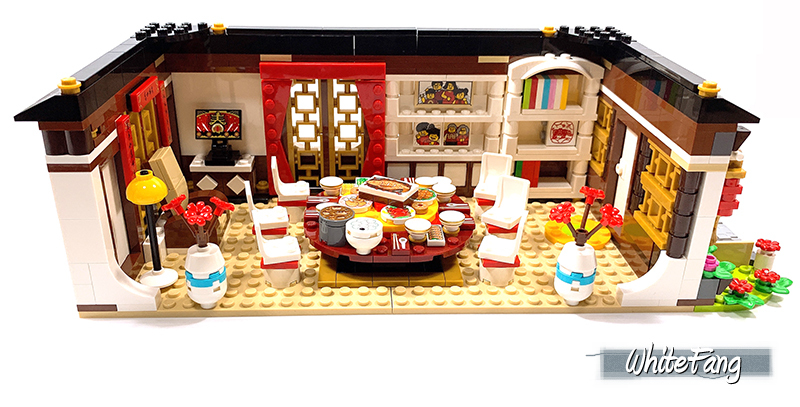 This set reminds me of the Spring Festival Eve dinners I had with my grandparents when I was a little kid. I love it so much, especially those dishes. 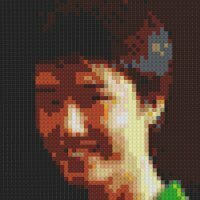 It seems that if I really want this, I have to order from a bricklink seller from an asian country. Anyone have a suggestion on which country offers reasonable shipping to the US? I have been thinking about this and it might have something to do with this set (probably) being produced in China. Different warehouse. Different inventory. 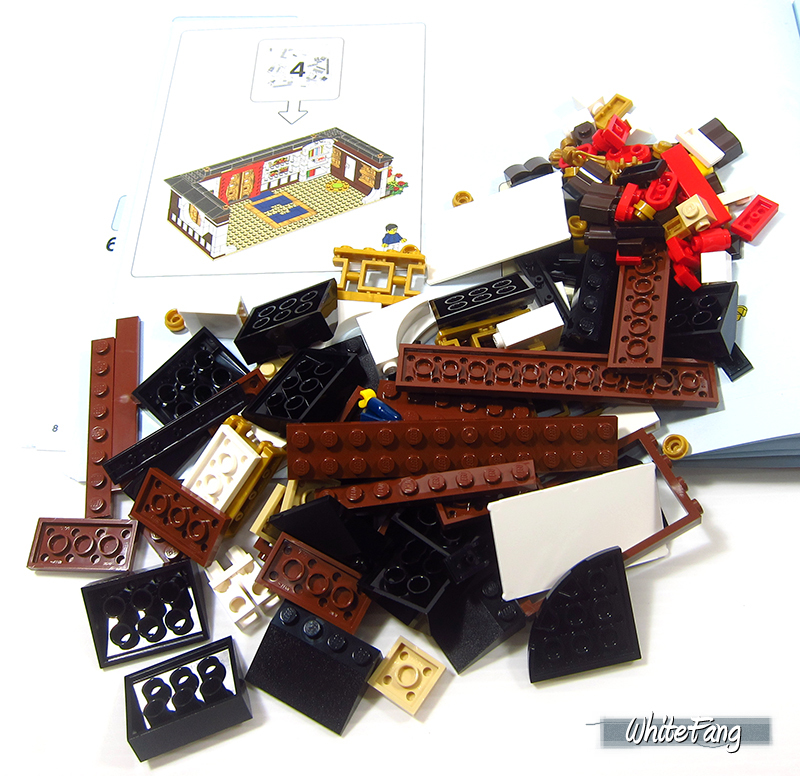 Totally not sure, but it could explain why so many parts could be printed for this set. To clarify; every printed parts is a new element, which takes up warehouse space. And space is limited, even for TLG. Thank you very much for the great review, WhiteFang! 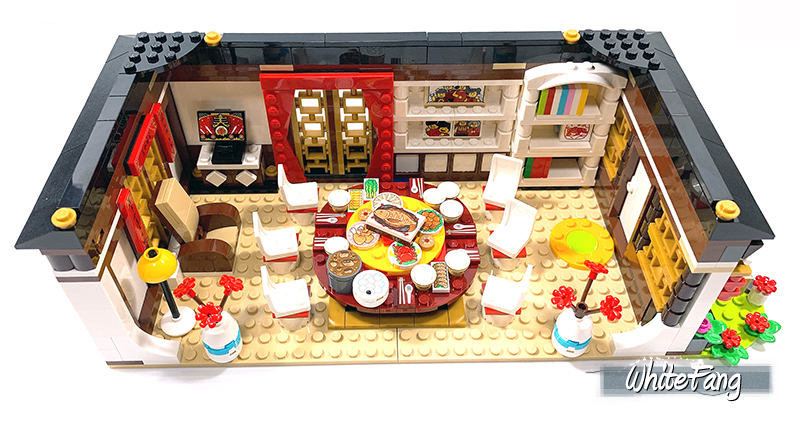 I voted for outstanding since this is really a totally amazing set - that a great architecture, so many interior details, that much new food prints and so many cool minifigs! The only thing I don't like is that the long outer wall is that plain. 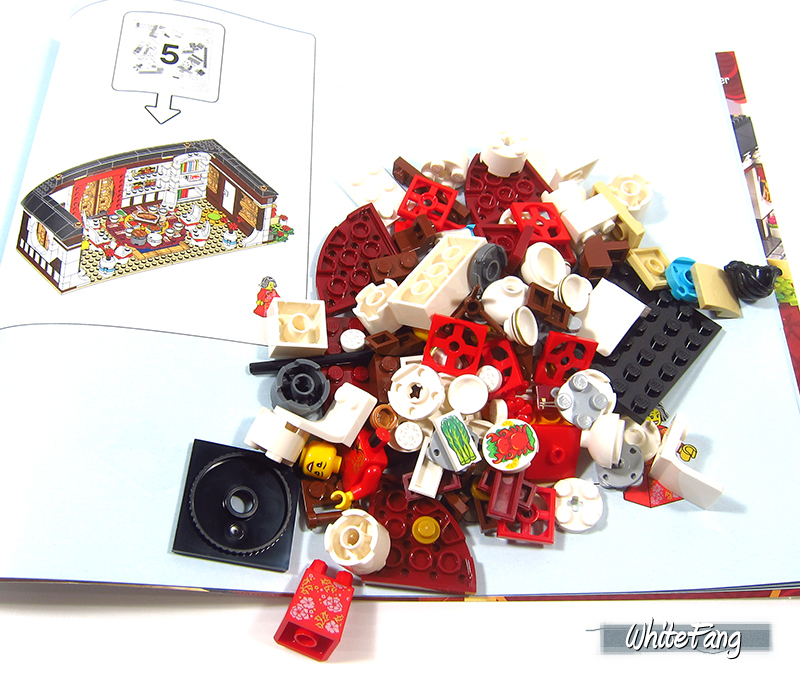 It's really a shame that TLG sells all these Chinese New Year sets only in Asia and not all over the world! Thank you guys for your thoughts and comments. I could think so. It is just a plausible theory. Fully agree with you on the reunion dinner aspect. I will miss them deeply. Glad you had positive vibes about this set. Agree on the distribution hype and it is indeed unfortunate. 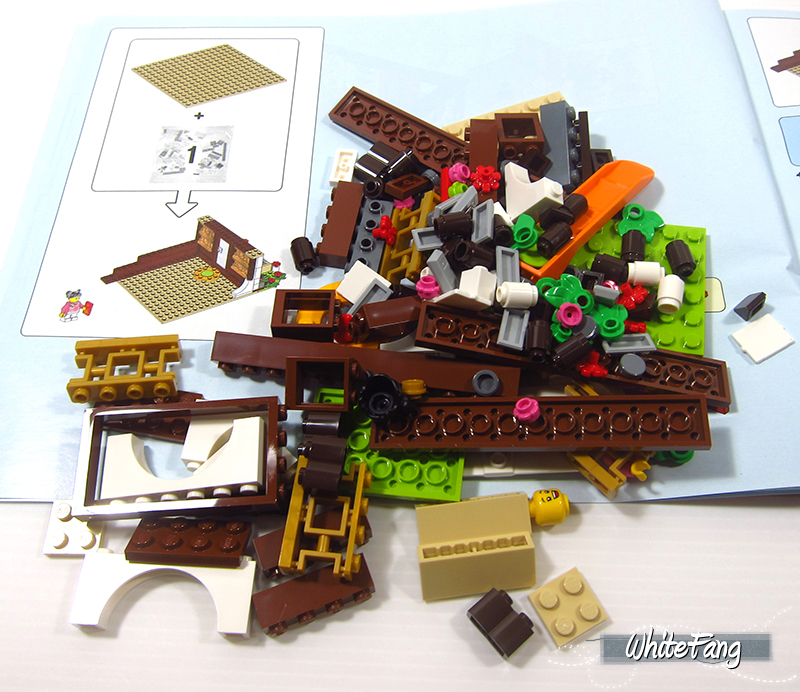 Well, it could also be part of the wider TLG strategy because they could not know how well these sets could perform on worldwide and if other parts of the world like US and Europe could even interested in such Chinese centred LEGO designed sets. I think this design looks great. When I visited a chinese restaurant a year ago, our table had also a "Lazy Susan"
Is that common for chinese houses/ restaurants and is that the official name? I reckon is about USD$4 per set. Take a look at these new images. Overall, I felt it added a much better finishing than the official stickers. Just my one cent.